Several rounds of discussions were held yesterday involving the cricket hierarchy and officials of the Sports Ministry including the Minister of Sports prior to the newly established selection panel sat down to choose the squad for the upcoming tour of New Zealand. The new selectors had met the coaching staff yesterday morning and then all parties met Sports Minister Faizer Mustapaha on the current status of the sport, SLC sources told The Island. 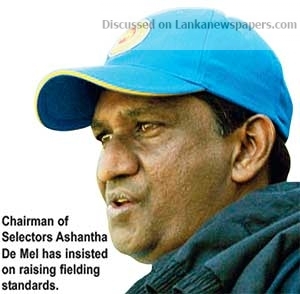 The new selection panel headed by former fast bowler Ashantha De Mel had insisted on the need to place a high premium on fielding after the standards hit new lows in recent times. Sloppy fielding and dropped catches cost the team dearly during the Asia Cup where Sri Lanka suffered heavy losses at the hands of Bangladesh and Afghanistan. The recent Test series against England was closely fought with England’s superior fielding skills enabling them to complete a 3-0 drubbing. When the selectors insisted on obtaining the services of a qualified fielding coach to be part of the support staff, there seem to have been some resistance indicating that SLC is not in a position to afford a reputed fielding coach. However, the counter argument has been whether it is wrong to invest heavily on an area that the national team has failed miserably. SLC already has an all time high budget on the coaching staff. In addition, there are also other resource persons from overseas who do short stints with the team. All in all, there are moves to obtain the services of a leading Fielding Coach to address the woes of the team. The Sri Lankan team has suffered many losses in the last 24 months and the official ICC Rankings rate them lowly. Currently, Sri Lanka are ranked seventh in Tests, eighth in ODIs and ninth in T-20 Internationals and if authorities fail to address the issue, very soon Sri Lanka will miss out on future ICC events like the World Cup and World T-20. While Sri Lanka used to be the best fielding side in Asia and not far off from teams like Australia and South Africa during their glory days, the fielding standards have nosedived rapidly in the last three years and the Sri Lankans are world’s worst fielding side at present. The new selection panel will announce the squads for the New Zealand tour in the next couple of days and they are expected to emphasize on fielding excellence when picking players.